Polygraph Instrument or Polygraph Machine? This article is in response to Director Raymond Nelson’s article published in the Sept/Oct APA Magazine. I commend Ray’s scholarly and dedicated contributions to the APA and the polygraph profession before expressing my opinion of his article. But arguments on the ongoing debate in our profession about the application of the descriptive term “instrument” versus “machine” can reflect an important expression of terminology to the larger scientific community. As Ray mentioned the expression “instrument” is widely used in polygraph schools. In my teaching of neurophysiology at NCCA from January 1997 through January 2007, I often made specific reference to the recordings obtained during a polygraph examination were done by an “instrument” and not a “machine”. The background of the application of those descriptive terms can have some multiplicity of usage. Let’s start with some variable definitions of the by Joel Reicherter Professor Emeritus, SUNY word: “instrument,” not applicable to the polygraph profession. In the medical community, many technical “instruments” provide physiological patient data to the physician for analytical assessment and diagnosis – the EKG or EEG recordings would be good examples. Now for the application of the term “machine”. Machines are devices designed to perform “work”. Work may be a difficult word to define in a simple sentence because of its many varied applications, particularly in our complex culture and technical advances in recent times. However, a simple and basic understanding of work may be of help to understand the application of the term “machine”. Perhaps the simplest form of work can be described as moving an object through a distance by a force, typically measured as foot-pounds. Typically, a machine will perform that task by converting energy into the force. For example, converting electricity into a snow blower “machine” which will compress air into a force to move the snow. How about a motorized lawn cutting machine that will convert gasoline into high speed rotating blades to cut the grass? A bull dozer converts gasoline into soil movement. These examples, and many others, dramatize that some form of work requires that energy be converted from one form to another to accomplish the task. Machines make that energy conversion. In the medical community, the device that helps to pump blood and assists in the physical breathing activity of a patient is commonly referred to as the “heart lung machine” because it does “work”. In contrast, the EKG provides technical data to the medical decision maker, and therefore referred to as an “instrument”. Now that I have provided a brief and somewhat simple description of “instrument vs machine”, I ask the following question: “Is the polygraph device an instrument or a machine?” The neurophysiological recordings of electrodermal activity, ventilation dynamics and cardiovascular activities obtained during a polygraph examination are the outcome of the brain’s management of these visceral systems. In that regard, the polygraph recordings parallel the EKG and other physiological recordings obtained for medical evaluation of the subject (patient). Like the medical doctor who must evaluate the “instrumental” recorded data, the polygraph examiner must have the knowledge to follow the proper examination protocols and the neurophysiological (PDD) skills to evaluate the recording outcome. If we can agree on the definition that a machine does work like an automobile’s engine converts the energy provided by gasoline into a moving force or the snow blower converts electricity into high pressure air to move snow, then what would be the work effort of the polygraph device? In my opinion, the algorithms developed by polygraph researchers to assess the neurophysiological recordings obtained in the polygraph format setting must be evaluated by the examiner for decision making. As in all science, particularly medical science, data collected from physiological activity leads the healthcare evaluator to assess the recorded outcome. Keep in mind that all scientific tests are subject to an error rate. To declare a test to be “scientific” does not mean free of error but rather the testing format followed accepted testing protocols by that discipline. The most significant protocol in science is to compare a “variable” to a “control”. An “inconclusive” outcome is a buffer against an unacceptable error rate. In conclusion, an “instrument” must record the polygraph subject’s neurophysiological assessment of the question presentations. Based on the scientific polygraph question format designs available, pretest examination interviewing skills and post-examination recording test data analysis methods, the Polygraph Examiner is the “Decision Maker” of the instrumental recordings obtained in the polygraph setting. 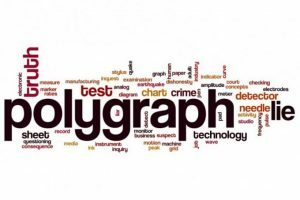 If historical definition of terminology is still a problem for polygraph personnel, perhaps we can adopt the term “Polygraph Device”.